Rockhampton, the biggest city in the Fitzroy River Basin, is 640 km north of Brisbane, just north of the Tropic of Capricorn. It is 40 km upstream from the mouth of the Fitzroy River, and is the largest town in the Fitzroy River Basin, a region extending further inland than the area usually thought of as Capricornia. With its spectacular riverside setting, it was, by the 1890s, along with Charters Towers, Toowoomba and Ipswich, one of Queensland's greatest inland cities. Many of the main buildings of that era survive, giving the central area of the city a continuing sense of grandeur. Europeans first settled the district in 1855 when Charles and William Archer established Gracemere pastoral station, ten kilometres south-west of the site of the later town. The Archer brothers were followed by other settlers in a matter of months, and they established a rudimentary wharf facility as far upstream on the Fitzroy River as conditions allowed for the movement of livestock. The colonial government decided to establish a site for a Court of Petty Sessions in the north, and the wharf was the best option available. 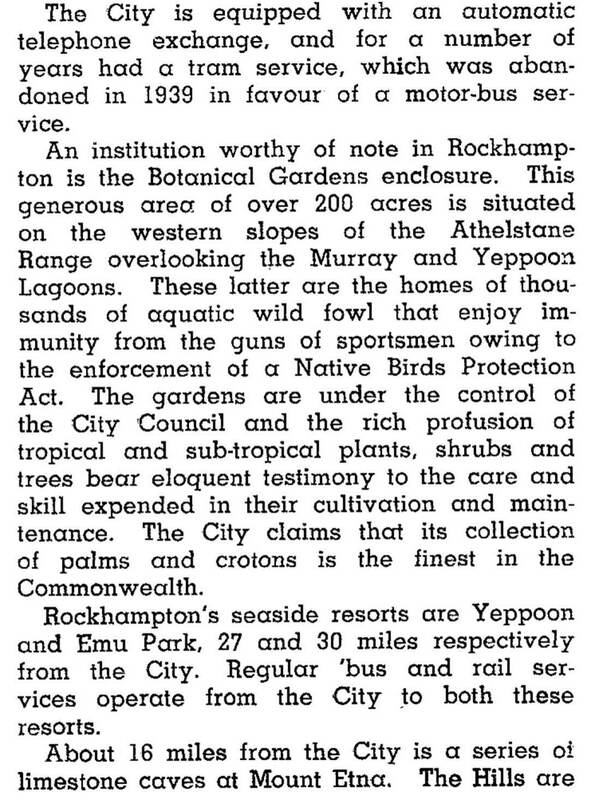 Lands Commissioner Wiseman apparently fixed on the name Rockhampton, derived from the rocky bar upstream from the wharf and adding 'hampton' to denote a town. There were two newspapers, the Rockhampton Bulletin and the Northern Argus. Steamers plied between the wharf and Brisbane and Sydney once a week. Gold and copper mines at Peak Downs, along with hides, tallow and meat preserving, injected wealth into the local economy. While the lagoons and the botanic garden offered mild relief from oppressive inland heat, Rockhampton's inhabitants looked to the coast and chose Yeppoon and Emu Park as their watering places. Scarcely a year passed without a short-lived rush to a new goldfield somewhere around Rockhampton, but something rich and permanent seemed to emerge from Mount Morgan in 1886. By 1890 the mine was run by Rockhampton investors, chief among them, William Knox D'Arcy. 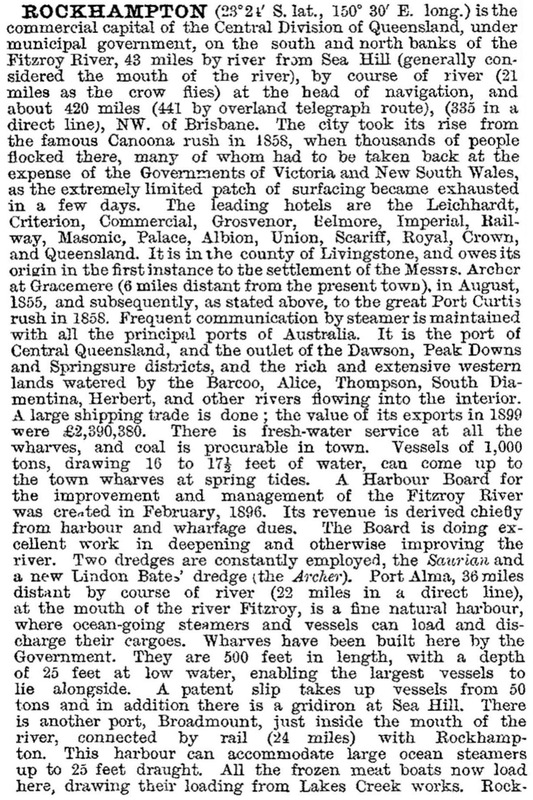 Another of the newly arrived Rockhampton entrepreneurs of the 1860s, D'Arcy worked as a solicitor before moving into mining. Becoming a 'Mount Morgan millionaire', he supported the local rowing club and jockey club and later invested in Persian oil and helped set up British Petroleum. Rockhampton became the northern regional capital and with wealth from its mineral hinterland was built to last. 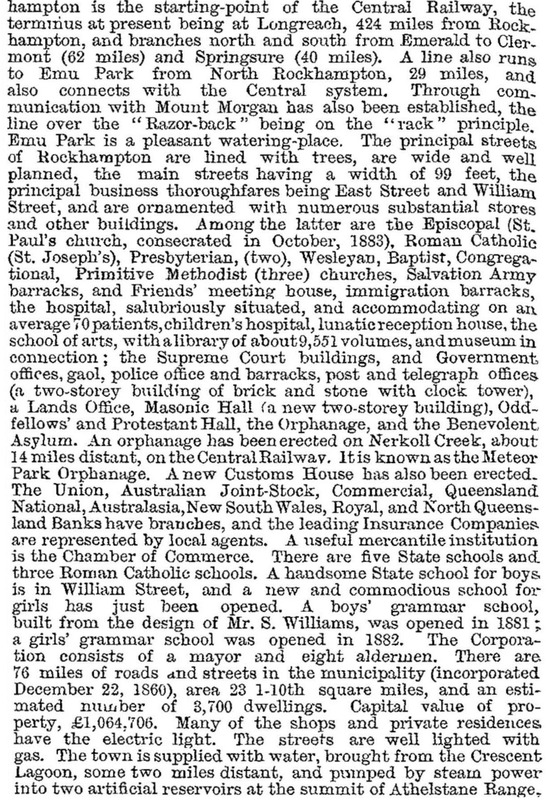 New buildings included St Paul's Anglican Cathedral (1883), Supreme Court building (1887), St Joseph's Catholic Cathedral (1889) and Customs House (1901). All survived as heritage buildings, along with the Quay Street precinct beside the Fitzroy River. The precinct contains numerous commercial and civic buildings: Criterion Hotel (1889), Fitzroy Shire offices (1896), the Mount Morgan Company's office (1897) later an ABC studio, and the Commercial Hotel (1898). When the Customs House was completed in 1901 the Fitzroy River wharves were the sole import/export point for central Queensland, as the railway line from Brisbane had reached only Gladstone, and Rockhampton was successfully fending off Gladstone's numerous attempts to develop Port Curtis. The need for a deep-water port was answered with Port Alma at the mouth of the Fitzroy River. 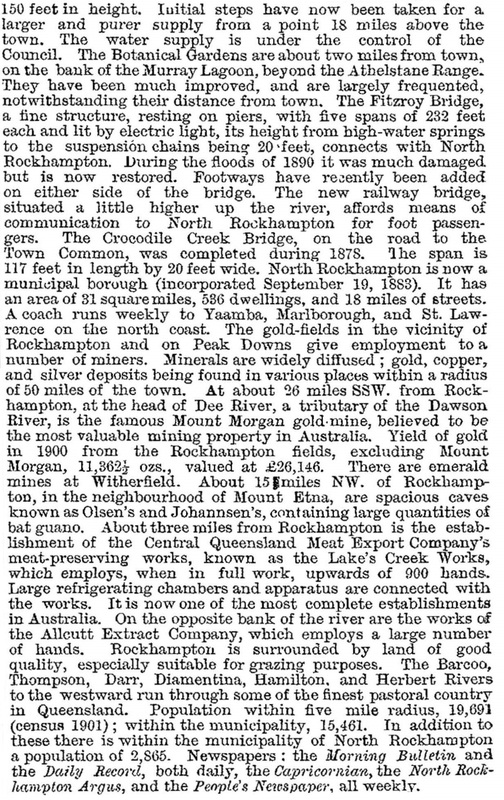 A northwards extension to Mackay was not completed until 1921, enabling Rockhampton to continue as a regional export point. A railway crossing was built over the Fitzroy River to North Rockhampton in 1899, joining a growing municipality that had been proclaimed in 1883. North Rockhampton was the poor relation, but it constructed a substantial borough chamber in 1886. The town had been joined to Rockhampton by a graceful iron suspension bridge in 1881, replacing a system of punts and ferries. The north side municipality was amalgamated with its more affluent relation in 1919. Such was Rockhampton's commercial strength, its neighbouring rural shires each positioned their offices there for generations: Fitzroy Shire's offices were moved to Gracemere in 1979 and Livingstone's to coastal Yeppoon in 1982. Rockhampton was a premier location for private secondary schools: Rockhampton Grammar (boys and girls 1881-85, then boys only until 1977 when it reverted to co-educational); Rockhampton Girls' Grammar (1892); Range Convent High School (1907); and Rockhampton Technical School (1914). A municipal tramway system operated between 1909 and 1939, with a fleet of steam trams, displaced by council-operated buses. 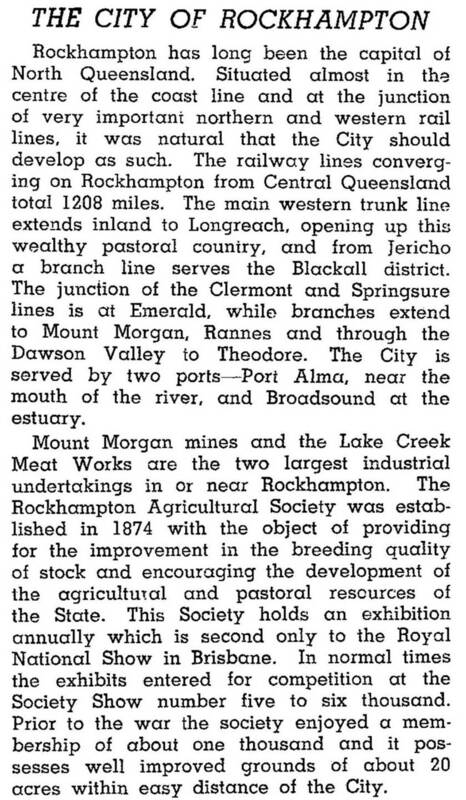 By 1900 the Central Railway from Rockhampton had reached Longreach, with branches to Clermont, Springsure and Mount Morgan. Much of the land it crossed was semi-improved or brigalow scrub, suitable for beef cattle grazing. Rockhampton was on the way to becoming the beef capital of Australia, with a pioneering meat processing works (1871) at Lake Creek, seven kilometres east of the town. 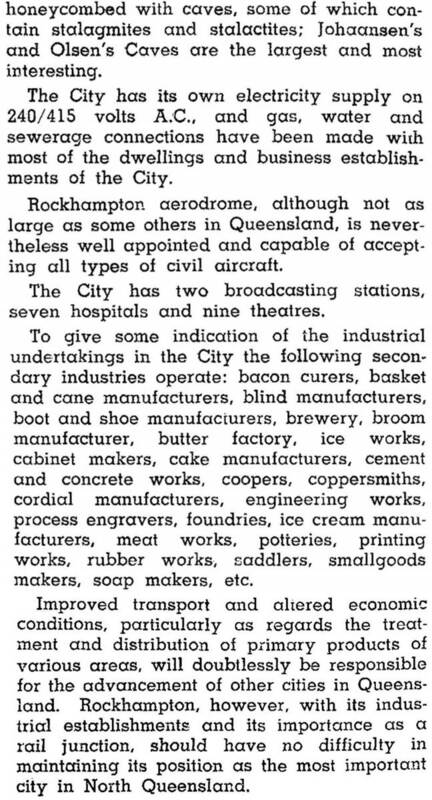 Ninety years later Rockhampton claimed to have central Queensland's leading secondary industry, handling chilled, frozen or canned beef, as well as mutton, ham, bacon and smallgoods. At peak times it employed 1750 Rockhampton residents. A railway extension from Clermont in 1910 brought Blair Athol's coal within reach, keeping Mount Morgan's ore crushers in operation. Forty years later Dawson Valley/Callide coal and Blackall coal was being extracted by open-cut methods. The future lay in coal exports. Gladstone's turn as a deep-water port finally came, and special coal carrying railways were opened direct to Port Curtis. Peak Downs coal was taken north to Mackay harbour. This turn of events made Rockhampton look vulnerable in the future, one commentator in 1971 referring to the 'air of anxiety about Rockhampton' compared with the 'optimism radiating from ... the Fitzroy Basin' as a whole. In fact, Rockhampton showed a steady growth in population during 1954-76, albeit less spectacular than Gladstone. By the 1970s Rockhampton's urban area was spilling into neighbouring Fitzroy and Livingstone Shires. In 40 years the census populations of the two shires and Rockhampton increased from 55,024 (1961) to 99,415 (2001). When the coal and heavy industry growth was surging ahead, Rockhampton appeared to be missing out, but the information and service age brought benefits. The largest employment sectors in Rockhampton in 2001 were retail and wholesale (22.6%), health and community services (11.5%) and education (10.1%). Accommodation and hospitality - the tourism related industries - had just 5.6%. The significance of education was seen in the six private secondary colleges, including two Anglican and two Catholic, and the Central Queensland University which began in 1967 as an Institute of Technology. In 1991 the Council acquired the just-expanded Rockhampton airport which offers regular jet services to Brisbane and onward connections. Rockhampton's tourist attractions tend to be of the cultural kind: the botanic garden, reputedly the finest tropical one in Australia; Quay Street historic precinct has nearly twenty heritage sites, including the Customs House. East Street has the court house (1886) and the former post office (1892). Bolsover Street has eight heritage sites, including the school of arts, the town hall (1939-41) and the Railway workshops (1915). The Anglican, Catholic, Lutheran and Presbyterian churches/cathedrals are also listed on the Queensland heritage register, and the grammar schools and the Range Convent high school are prominent buildings. More than 50 heritage sites are found in Rockhampton, south of the river, along with the central shopping mall. The city's growth area has been North Rockhampton, necessitating a second bridge in 1980. Beside the first bridge the Kershaw Gardens offer a fine prospect upon entering North Rockhampton. Controversy arose in 2003 with the re-emergence of an urban legend alleging that Rockhampton's city lights spell out the word 'Hell' when viewed from Mount Archer. Councillors voted against a proposal to install additional lighting that would turn 'hell' into 'hello'. The Fitzroy River at Rockhampton has a long history of flooding. Since 1860 Rockhampton has had nine floods very close to or above the ‘major’ category and about 20 were classed as ‘moderate’. About one metre in river height separates major (8.5 metres) from moderate (7.5 metres). The worst recorded flood was in 1918 (10.1 metres), and Cyclone Joy in 1991 produced a river peak of 9.3 metres. Other bad years have been 1929 and 1954. In early January 2011, heavy rain during December began a slow rise in the Fitzroy River which peaked at 9.2 metres on 6 January. The water began receding on 16 January, and lay about for days afterwards. Depot Hill and Port Curtis were inundated, and West Rockhampton and the airport were severely flooded. (Other suburbs included Berserker, Lake Creek, Park Avenue and Wandal.) Rockhampton was encircled by floodwater for as far as the eye could see. Tropical cyclone Marcia crossed the coast at Shoalwater Bay in February 2015 as a Category 5 cyclone, having escalated from Category 1 in just a few hours. As it progressed southwards it was downgraded but caused widespread damage and subsequent flooding in and around Rockhampton. In 2008 Rockhampton City was amalgamated with Fitzroy, Livingstone and Mount Morgan Shires to form Rockhampton Regional Council.